The 1950s could be called the "Golden Age" of Jet Aircraft modeling kits. The propeller driven airplane was being eclipsed by the new jet aircraft. Captain Chuck Yeager flying the Bell X-1, named the Glamorous Glennis, had broken the sound barrier. The Korean War brought home in monotone newsreels and early television the "dog fights" between Sabre Jets and MIGs. Navy Panther jets were flying from aircraft carriers. New fighter aces Ted Williams and McConnell became household names. Keeping pace with the new jet aircraft rolling off the assembly lines, new jet kits seemed to appear on the market on a daily basis. My Saturdays were often spent at either the local hobby store or Woolworth's. The store shelves were filled with jet planes with names like Sabre, Delta Dagger, Shooting Star, Demon, Stratojet, Panther, Voodoo and Scorpion. The kits were manufactured by Aurora, Frog ("Flies Right Off the Ground"), Lindberg, Monogram, Pyro, Renwal, Revell and Strombecker. The model industry was in transition. Plastic was entering the marketplace, replacing balsa and solid wood, but serious modelers frowned upon the new plastic kits. Balsa and solid wood kits were still in their prime and plastic was looked upon as a cheap substitute and a passing fad. However, plastic kits were able to provide more detail than balsa or solid wood. Strombecker was a major manufacturer of wood furniture for dolls and doll houses, advertising their products as "First in Solid Models," attempting to capitalize on the bias against plastic. Strombecker Manufacturing Company of Moline, lllinois, did not produce a plastic kit until 1956, when they introduced the Sea Dart. Strombecker jet kits were marketed as "basic trainers" for the youngest builder. Two of the kits produced were the F-94 AII-Weather Interceptor Fighter and the FJ-2 Fury, a Navy-based fighter. Strombeckers were issued in a drab green and white box and each kit contained ready-shaped parts (wings, tail, fuselage, canopy), glue, sandpaper, decals and instructions. The Company employed an interesting marketing tool "Captain Jet" and the Strombecker Model Makers Club. For 25¢ and one kit end-flap, modelers received a 16 page booklet, "illustrated in full-color," which provided information on club activities. The membership kit included an official badge in the shape of pilot wings (Airman 1st Class), Secret Code for writing to other club members, information on the "Secret Handshake" and an individual "Secret Number." Talk about excitement, and for just 25¢! A complete "Captain Jet" kit is quite rare, but the pair of Airman 1st Class Wings are easier to locate . The Aurora story is interesting. The Company, located in West Hempsted, Long Island, New York, was operated by Abe Shikes, John Cuomo and Joe Giammarino and produced many of the most collectible jet aircraft kits of the 1950s. They were among the first to focus on the youth market using attractive packaging and low prices. Aurora issued its initial plastic jet kits in 1952. Shikes founded the Company to provide quality kits at a low price. Aurora was the first to print the price on the side panel of each box and like its contemporary, the Marx Company; moved into mass marketing of its product. Besides the price, the company printed a kit number on each box. The kit production number was employed to ensure a method of identification for ordering the kit. Rather than dealing only with hobby stores, the Aurora Company distributed kits to Woolworth's and W.T. Grant. They recognized that kids had limited funds and frequented the Five and Dimes to spend their allowance. Aurora introduced the 69¢ kit in shrink-wrapped packaging which reduced breakage and loss of parts. With the price printed on the side of the box, stores were prevented from marking it up. The kits contained few pieces and were easy to. make. The 69¢ price was right and with attractive box art, Aurora sold millions of kits. The Aurora factory contained 12 injection molding machines, with each machine producing three to four kits a minute. Aurora was able to sell in volume and keep costs down. The first kits were made of bright colored plastic. Aircraft fuselages were colored red, black, yellow and green. Early on the company did not worry about accuracy and the kits contained few pieces. When a young modeler became bored with them, the models could be blown up outside with fire crackers! The first was the Grumann Panther F9F Jet Fighter, followed by the Lockheed F-90. Gradually Aurora began to design and sell more complicated models such as the 8-47 Stratojet, F8U-1 Crusader with a length of 13" and a wingspan of 8 1/2". One of the most beautiful and collectible kits of the period was the Canadian Avro Arrow CF-105. The Canadian government cancelled the Avro Arrow project and immediately the kit became a collectible item. Aurora included a coupon in each kit for their new catalog featuring the entire product line. Originally the catalogs sold for 10¢ and many dealers provided them free in hope of encouraging repeat business. Other companies followed this marketing tool and today the old catalogs have become collectible themselves. The catalogs are a valuable reference tool for building a collection, dating models and enjoying the beauty of the catalog's pictures. A major competitor of Aurora was the Revell Model Company of Venice, California, founded in the 1950s. Eventually Revell became the world's largest producer of plastic model kits. The Company was American-owned and formed subsidiaries throughout the world, seeking a worldwide markel: for its kits. 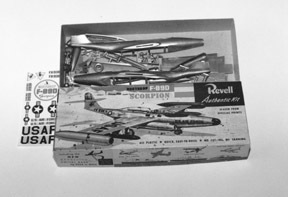 Revell produced a great variety of jet kits and moved aggressively into gift box sets with a central theme. Set G-204, for example, entitled Three Jet Fighters consisted of a F-94C Starfire, F7U-3 Curtiss and a F9F-8 Cougar. 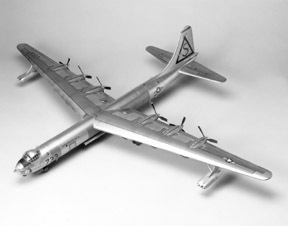 Set G209 Strategic Air Command Bombers Gift Set containted a B-29, B-36, B-47 and a B-53. Both sets were issued in 1954 at the height of the "Cold War." Kits produced by Revell from 1955-1959 are known as "S" kits. The "S" refers to the type of glue to be used, for styrene plastic instead of acetate plastic. Many collectors consider 1953-1959 to be the "Golden Age" for Revell kits. Each Revell kit was "scaled from official plans." The box advertised "all plastic, quick easy to build, no cutting, no sanding," remarks aimed to sway those who still preferred wood. Each company had a gimmick. Revell's was anew "Revolving Swivel Base." The aircraft was mounted on a stand with the base being a representation of the globe. The base contained a space to put the decal which identifled the plane type, such as Northrop F-89D Scorpion. The instruction sheet for the Scorpion included decorating ideas: "Display the model on a clock stand, lamp base or (my favorite) on Dad's cigar humidor." Of course in 1953 Cuban cigars were still legal. A unique kit was produced by the Pyro Plastics Corporation of Union, New Jersey. Pyro specialized in replicas of Civil War pistols and Kentucky Rifles, but also produced aircraft kits. They offered a large kit called "Design-A-Plane," an authentic plastic model designing construction kit. The kit contained a computer, which bore an uncanny resemblance to a slide rule. Over 4,000 jet fighters could be designed and built with the parts in the kit. No cement was required, it was the forerunner of snap together kits, enabling the builder to remake the kit in many variations. Budding aeronautical engineers loved the kit. Other companies produced unique aircraft kit ideas to keep abreast of the competition. The Lindberg Line, "Famous the World Over," in business since 1933, produced the Thompson Trophy Winner Crusader F8U kit. The Company employed the picture of the winners of various events on the box cover. The Lindberg Company was also famous for providing motors for their ship kits. In the 1950s a small motor was provided in the F-104 Jet Fighter kit. The kit was advertised as a plane with a realistic jet sound. The obvious problem was providing an inexpensive motor that didn't break or wear out quickly, nonetheless, an innovative idea. The Monogram Company of Morton Grove, Illinois, began to make the transition from wooden to plastic kits in the early 1950s. In this period Monogram produced two types of plastic and wood combination kits. Balsa kits with plastic parts were known as "Super-kits" and "Speedee-Bilts" were stick/tissue and plastic construction. The "Super-kits" were issued in a red, white and blue box and included the F-84, F-86 and MIG-15. n1e "Speedee-Bilts" were issued in red, wlute and blue boxes then later reissued in full-color boxes. The "Speedee-Bilt" collection includes F-84, F-86 and a F-94F Panther. Some jets were available in both formats. If the jet kits of the 50s were not as accurate or complex as kits today, what drew kids to them? Partially it was the price and ease of building. More importantly would be the box artwork. The first kit boxes were limited in colors and rather nondescript. With emerging jet planes, the kits began to take on an exciting appearance. Companies began to employ artists to design and draw the artwork for their boxes. (My first kit was an Aurora "Famous Fighters of All Nations". I can still see that YAK 25 with the bright red stars on the fuselage in flames on its way down to a horrible end,) The stable of artists at Aurora included Jo Kotula, James Cox, James Bama, Mort Kustler and others. Jet plane kits have become collectible just for their artwork. Many collectors hunt for not only the kits, but the boxes, as well. As aviation entered a revolutionary phase with jets and missiles, the graphic printing industry kept pace. The box artwork became a major marketing tool. For example, the Avro CF-100 All-Weather Fighter in Aurora's "Famous Fighters" series is so graphic that one can almost see the color of the pilot's eyes. Another example of Aurora's famous box artwork is the Russian Nuclear Powered Bomber. The Kremlin is pictured in the background and the sky is bright red and the large black nuclear symbol is a nice touch. Two personal favorites have been the Douglas D-558-2 Skyrocket and the Northrop F-89D Scorpion. Many kids imagined climbing the ladder and riding into space in the Douglas D-558-2 just like their hero Captain Chuck Yeager. The F-89D Scorpion was pictured on an airfield in the Distant Early Warning Line (DEW LINE) scrambling to intercept a Russian Bear bomber. It evoked images of the canopy shutting and the roar of the engines and the feeling of climbing to intercept. The Lindberg Company did not employ action scenes, but relied on detailed accurate drawings of the aircraft. Lindberg's Ray Gaedke drew planes accurately and his trademark was the speed line to simulate a fast moving jet. The model kits themselves may not have been as accurate, but the boxes were vivid. A lesser known area of collecting is in instruction sheets. The sheets are usually missing from kits and are an important aspect of collecting. Manufacturers began to employ the sheets for advertising purposes. The Aurora "Famous Fighters" instruction sheet contains a full page ad of other kits. The instruction sheet for the Avro CF-I00 contains a back page which declares, "Only Aurora Gives You All These Scale Model Features." Pictured are Kit No.119 F8U-1 Crusader, Kit No.493 B-47 Stratojet and Kit No.292 the Douglas F4D "Skyray." The front page of each instruction sheet contained "Interesting Facts about… " whichever aircraft was in the box. The kit builder was able to learn important information about the plane—when the first prototype of the aircraft was flown, the speed and climbing range of the plane, details of its construction and even where the plane was stationed. (Who needed spies to find out important information?) The jet kits of the 1950s were beautiful and unique and nothing today compares with these vintage models. The difficulty in determining price is due to the re-issue of many jet kits. Care should be taken to determine whether purchases are originals or reproductions. Many companies have gone out of business (Aurora) or have been bought out by other companies. The plastic injection molds in some cases have been sold several times. Reissued kits have appeared with "Made in Mexico" or "Made in Spain" stamps. Revell Monogram has begun re-issuing kits from the 1950s with the original box art. However, the company has placed the date 1994 on the side of the box. Most other companies date somewhere on the side of the box to distinguish between originals and re-issues. To learn more about the subject there are several excellent books on the collectible kits. John W. Burns has published a Value Guide for Scale Model Plastic Kits. A second publication is the Encyclopedia of Military Models by Claude Boileau, Huynh-Divh Khuong and Thomas Young. The book provides a detailed history on each kit and any variations. (Over the years I have collected various catalogs from companies that specialize in older kits and employ them as a guide.) According to Bill Byrnes of Collectors Lane in Toronto, Ontario, older material is becoming harder to find. Material does turn up at yard sales or auctions. The auction can be used as a guide to find the value of jet kits. Condition is very important. Mint condition means still in the original box with the shrink wrap on and untouched. There is a great difference in value for jet kits in mint versus non-mint condition, of course the mint condition kit demands a premium. Hobbyists built their kits, and collectors kept them. Another factor is the number of models produced, what was the run number? In the case of the Aurora Avro Arrow CF-I05, the kit is valuable because the Canadian government closed the project down before production began. If there are not enough jet kits to search for, and you enjoy a collecting challenge, try to find an Aurora figure of Steve Canyon Jet Pilot produced in 1958. Also search for the Aurora United States Air Force Jet Pilot issued in 1957. Both pilots are one-eighth scale and were issued to complement jet aircraft kits. Both are rare and difficult to find! If value is your only reason to collect, you need to be cautioned—material moves down as well as up in value. According to Bill Byrnes of Collectors Lane, some kits from the 1950s have declined in valued due to fact that they were reissued.